Spring is always a busy time for writers as there are many conferences to attend and schools to visit. A few weeks ago, I was in San Antonio for the 58th annual conference of the International Reading Association. I participated in two signings that celebrated the launch of the new Poetry Friday anthology, published by Pomelo Books and edited by Sylvia Vardell and Janet Wong. I also took part in a panel on Content Area Reading for an IRA Special interest Group led by Barbara Schneider of Grand Valley State. On Sunday evening, the Random House dinner at Fig Tree Restaurant was a true highlight—a chance to catch up with some educator friends from past IRA’s, meet some new ones, and talk books, books, books! Other Random House authors in attendance were Erica Perl, Matt de la Pena, Kirby Larson, and David Levithan. You can find out more about all of them on the Random House author site. 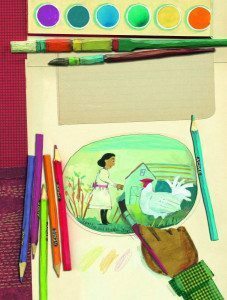 About a week later, illustrator Melissa Sweet was in Fort Worth, Texas, for the annual meeting of the Texas Library Association. Melissa’s Balloons over Broadway is on the TLA’s Bluebonnet Master list for the upcoming school year. She signed Balloons and also A Splash of Red on Friday, April 26th, and made a lot of librarians very happy! 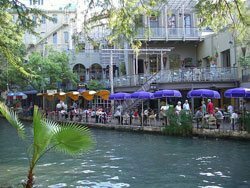 Isn’t San Antonio’s Riverwalk just wonderful? I went there once to see the Christmas lights. Stunning! !